The both sides of the mummy was a good place for strategical iconography. At first sight, it seems that the Egyptian artist did not spend many sources in the decoration at right and left of Artemidora. It is about a very minimalist image consisting just in three golden appliqués of Osiris being flanked by Isis and Nephthys. Osiris, Isis and Nephthys. A Royal Triad. Osiris is depicted standing and wrapped in the shroud indicating his condition of dead God. Nevertheless, we also notice that he holds the whip and the crook and he wears the Osirian crown. The three are items, which indicate the royal nature of Osiris in this image. 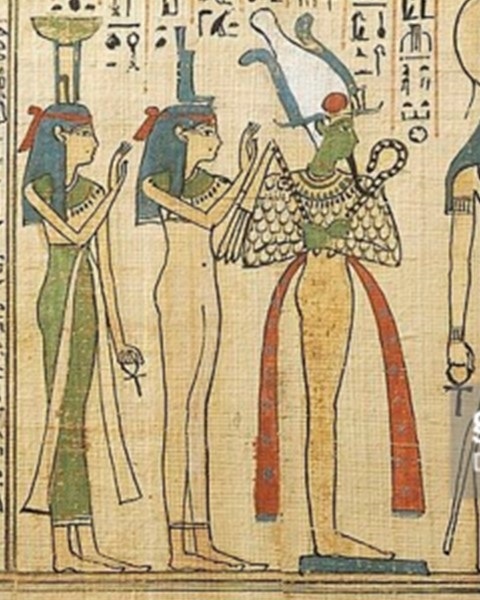 Isis and Nephthys, with long dress, are also standing and looking at him. In this case, the two goddesses are not kneeling and they do not wear any solar reminiscence. The two mourners of Osiris stand in front of the dead god raising an arm forward. With this gesture they are not covering their faces as in a mourning action (as we saw before on the feet of Artemidora); Isis and Nephthys are here the ones who venerate and revere Osiris after his resurrection as King of the Hereafter. Book of the Dead of Khonsumes. Isis and Nephthys behind Osiris. We are facing here a total Osirian scene. In fact, this composition with the three figures at both sides of the mummy of Artemidora reminds the typical scene on walls and papyri, in which Osiris sits on the throne while Isis and Nephthys accompany him behind. In this case the Egyptian artist looked for a way of making the same composition but adapted to along and most empty space; so he disposed the three images in an equilibrated and symmetrical way. The final rebirth of Osiris was not a gratuitous scene. With it, the idea of the resurrection of Artemidora was reinforced. Again, a concise but effective image at both sides of the corpse of Artemidora was carefully selected for the benefit of the dead.